Apart from the ETFs of other carriers being paid, T-Mobile made sure we knew they have the best LTE coverage in the U.S. At least, they have the fastest. Results gathered from real-life users’ tests on SpeedTest.net have shown T-Mobile’s average download speeds to be faster than all three of the other major U.S. carriers. Tmo’s LTE now covers 209 million people in 273 metro markets, which makes it the fastest growing too. This – of course – in thanks in part to the roll-out of 20+20 LTE. It’s begun in Dallas – as we reported back in November – and is making its way quickly to other major metro areas. Branded as Wideband LTE, it brings much, much faster download speeds. For those of you worried about having to buy a new device, you’ll be glad to know that most of T-Mobile’s current LTE lineup is compatible with the 20+20 network. Any category 4 device, like the Nexus 5, LG G2 and Galaxy Note 3 will be able to take full advantage of the speeds on offer by the 20+20 network. Category 3 devices like iPhone 5/5S/5c, Galaxy S3/S4/Note 2 will be compatible, but, won’t be quite as fast. Still, plenty fast enough. During the keynote they made a point of comparing this with Verizon’s new AWS airwave offerings, which amazingly, aren’t compatible with many of its phones. Of course, the three new devices (Sony Xperia Z1S, LG G Flex and Galaxy Tab 3) are all compatible. One thing I really enjoyed about today’s announcement was the feeling of honesty. We know T-Mobile recently agreed a deal to buy Verizon’s low-band A-block airwaves. The deal involved around $2.3 billion and some swapping of various spectrum. They refused to give any promises to roll this out quickly. In fact, when discussing time scales, it seems more likely that it’ll be in the second half of the year, perhaps even the fourth quarter, before we see any of these markets lighting up. The idea here is to expand and broaden the LTE coverage in some key markets, and bring better quality coverage. Low-frequency airwaves are much more adept at getting through walls and in to buildings. It’s an absolute must for a network that almost solely relies on higher frequencies for its coverage. Network + Insane Offers = Lots of new, happy customers? See, T-Mobile could easily have presented the new Uncarrier plans today without once mentioning coverage. The deal to get people switching for its network is pretty incredible. But, the fact that it’s taken time to make a big deal about its LTE expansion, the acquisition of lower band airwaves and the upgrade to 20+20 LTE, means that magenta is as serious about the experience of being on the network as it is about being the most competitively priced option in the wireless industry. Perhaps what will be more interesting now is seeing how the competitors respond, particularly AT&T. Why not switch to the carrier that provides you with the best deal and coverage? Be thankful that you get what you pay for. Are you in a LTE Market? Actually I am in a market but I do not get LTE because I am not in downtown which I hardly go to. But I don’t complain about my EDGE speeds. Also agree with roy above on TMO coverage in Peoria/Morton/Washington/Joliet/Aurora IL areas. These areas are important to a major multinational manufacturer, with many international employees/visitors. TMO may not recognize the potential number of these GSM phone users, as possible customers..
TMO can always do better in areas outside the big metros. No data coverage on major interstates, once you get 45 miles outside of downtown Chicago, IL, is not acceptable, if TMO wants to compete. I-80 westbound, southbound I-55 and I-57 are major Illinois interstate examples of this. I live in Yuma AZ and it’s another area with terrible coverage. Entirely Edge but get the three competitors have LTE. Love you, T-Mobile, but ya gotta step it up in that area. If it’s important enough then you should switch to another carrier. T-Mobile’s LTE is supposedly the fastest. I’d like to use them for LTE access on my soon to be purchased Windows 8 tablet. It as built-in LTE. Has T-Mobile announced any new types of mobile broadband plans? Will you get it though T-Mobile? If so you can get 200MB of free data. Or I think you can add on the tablet to your plan and get the 200MB of data and see if there are more plans (I would recommend going to a store or calling Customer Service). The 200MB free data only seem to be for iOS and Android devices. The Windows 8 tablet would be considered mobile broadband for PC. The same plans for hotspots and USB modems. They should have mobile network devices for laptops. Check the site, I’m sure they are about to, if not already, release something for your needs. Can anyone explain to me what’s this “category” thing? Does this pertains on the antenna’s limitation in handling data (newer = faster)? Where can I check this out? I always use unlocked non carrier branded phones. So I have the S4, when 20×20 LTE is deployed in more markets, can I hope/expect 70mbps-ish? Right now, the fastest I’ve ever gotten on T-Mobile LTE is 40.7mbps. Wow! Where was that? So you think the S4 will be capable of 70+mbps when 20×20 is deployed? , where I live, near downtown Waterbury I get 3-4 bars of LTE, 20-30mbps. I’m in the Dallas market and I’ve tested the new LTE speeds. I average about 50-70Mbps. However, in the mornings I can get over 100Mbps. I know, seems crazy and it really only happens in the morning when most people aren’t crowding the tower(s). I have screen shots to prove it, but it’s not going to be a common speed. You will notice a difference in speeds, but the usual factors of congestion can still effect the speeds. Do speeds above 10MBPS really matter for web browsing? I think high speeds will only benefit me when I am downloading stuff or running Speed Tests. More speed = less low dips when more ppl are on the same tower. Think the Superbowl, Marathons, etc. Carriers move in mobile cell towers in those situations. I know this also. I was gonna add that in, but I held back, not wanting to add too much in my post. Faster page loading; quicker response from the website serves. So yes, it does influence the web browsing experience. Of course, it depends on other factors as well. My browsers are setup to act like desktops so I don’t load mobile pages. From my experience, it does make a positive experience with browsing. I say the more speed the merrier!!! I wonder how would the 700 MHz would work out would they send out a software update to the phones? I’m just curious I got the nexus 5? The phone hardware would have to be able to support the frequency. If it doesn’t already, it won’t. A software update would not fix that. If the hardware does support it, then a software update would work. This same question was asked earlier in a previous article, no you would need to get a new phone to support that band. This is great but A-Block wont benifit much people what about users who have iphones and Samsung galaxy and current phones? yeah true, but I wanted to wait to upgrade till 5g comes out. I hear T-Mobile was bring them out soon. 5G is a very long way away. You won’t see that until around 2020. Maybe you’re thinking of LTE-Advanced? If so, that’s still 4G. I thought LTE-Advance is considered 5g. but yes, I am waiting for better phones to support that. Nope, it’s not 5G. Current LTE doesn’t meet the full 4G max speed (1Gbps). LTE-A is meant to be the first true 4G standard. So TMo doesn’t want us calling HSPA+21 “4G” anymore? I knew that someone would point this out. Yes, HSPA+ is mis-advertized as 4G, so there’s a chance that the same will happen with LTE-A. I hope not though, since that would screw everything up. HSPA+ is in my opinion NOT 4G at all. It is merely a beefed up 3G. What about the HTC One? Good question one I would like to know also. As proeco mentioned the HTC One is a Category 3 device. So It will be unable to take full advantage of the Wideband LTE but still will see speed boosts. Category 3 devices like iPhone 5/5S/5c, Galaxy S3/S4/Note 2 will be compatible, but, won’t be quite as fast. Still, plenty fast enough. Since I too own a HTC One, I looked the information up. According to FCC ID NM8PN07130, the HTC One is unfortunately only capable of Cat 3. The saving grace is that 4G LTE is plenty fast, no matter if it is Cat 3/4. But Cat 3 will still be able to take advantage of some speed boosts per the above referenced article: Category 3 devices like iPhone 5/5S/5c, Galaxy S3/S4/Note 2 will be compatible, but, won’t be quite as fast. Still, plenty fast enough. really the iphone 5 supoprts the A block spectrum? Fair enough. I got the shaft with the SIII in 2012 and early 2013 with the LTE upgrade. I am getting the S5 or another device, so I might get my Cat 4 support eventually. Thanks. They still need to expand edge coverage, and then expand HSPA and LTE. EDGE would be a total waste. Anything less than 14.4mbps HSPA+ is probably a waste at this time. May well be, but you need to have as close to blanket coverage they don’t have that, not even with edge. I agree. I have always hoped and though tmo is delaying coverage expansion so long, because they are waiting for VoLTE to be mature, so they only need to deploy a much cheaper and much more simple LTE only network in rural areas. An EDGE coverage expansion would be a waste, it would have to be supplemented with decent HSPA. Based on a 90s tech. It’ll cost them so much to put up equipment and then it’ll be as useless as no data at all. It makes no sense. LTE-A has protocols to utilize M2M. the cost and power requirements in several M2M deployments still favor GPRS technology. That might change in the future, but there is a certain advantage in keeping the GSM network running. 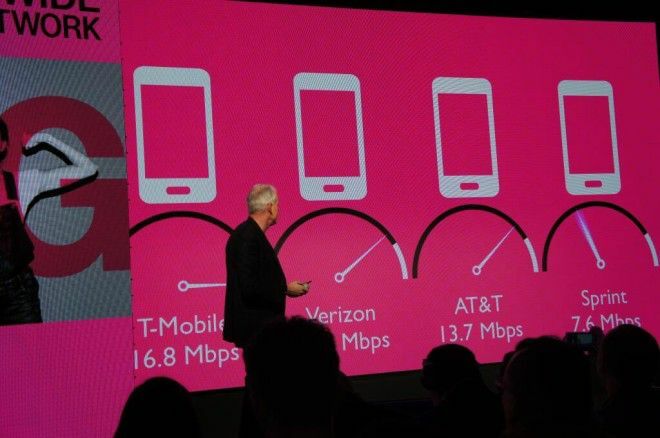 T-Mobile has added and will continue to utilize high band spectrum which gives them enormous capacity. This won’t stop. Now they will need to spend this year building out the purchased low band spectrum from Verizon and any additional low band spectrum they may purchase from other 700 MHz holders to improve in-buidling penetration, suburban reach and fringe areas. Hopefully by the time the next iPhone comes out it will include the new band. The ecosystem should be good for Band 12 later this year with AT&T finally getting on board and with the program. If T-Mobile could setup a roaming agreement with C-Spire and US Cellular using the same low band the ecosystem will grow faster. Is the lumia 925 compatible with T-mobile new 700 spectrum ? The specs show it can pick up the 700 band but we’re not gonna see that service roll out for some time. Also, the 925 is only a Cat3 device. Not likely, it will only pick up band 17, this new spectrum is part of band 12. So this is 700-12? On GSM Arena there are options for for 700, 700-13 and 700-17. What does the “700” box mean in terms of bands? I Know 700-13 is verizons 700Mhz c block. 700 just indicates that it’s in the 700MHz range, but there’s 4 bands within that 700MHz range. There are blocks A, B, C in 700 Lower and blocks C and D in 700 Upper. Thank everyone … im just as mixed up as before …. maybe the 925 will work but not perfectly like one of those devices i heard mentioned that will get a speed boost but will not be as fast as the new devices yet to be released. I assure you this isn’t a move to screw the customer base. If I still had my Galaxy S2 I’d be screwed out of the new freq. as well. Unfortunately, HTC didn’t feel the need to include the ability to cover other frequencies. It isn’t just the frequency, there is banding within the frequency as well. I doubt that the AT&T device supports band 12 either. It’s doubtful that any carrier would ever be far-sighted enough to negotiate the inclusion of a new spectrum capability with a manufacturer over 18 months before they had any possibility of deploying it. When the HTC One was ordered, not only did TM not own any of the spectrum in question, but they hadn’t even raised the finances to be able to buy it. In fact they probably hadn’t even completed the MetroPCS merger at the time that ultimately allowed them to raise the money. You are right, but some of the more recent model, S4 and Note 3, do support it. I believe it was a matter of locking them down and only leaving certain ranges unlcoked. NO idea what is really going on, but it seems possible. I may have misread something in that case. I am not finding anything to say that current devices are able to support it. My bad. We know that the money from the AT&T break up went directly to Deutsche Telekom and the majority of it was used to adjust their European debt situation. Around $1.4 billion was used to finance the network modernization program for TM. In October 2012, TM announced the MetroPCS deal which cost $1.5 billion or more. It’s therefore unlikely that there were funds available for a spectrum deal, even if it could have been foreseen that any part of the 700MHz band would become available. In reality, Verizon didn’t get interested in selling until they had spent $130 billion buying out Vodafone’s share of Verizon Wireless. At that point they could no longer sit around on spectrum holdings that they had no intention of using in the short term. They were also under pressure from FCC rules requiring that the spectrum had to be utilized within a particular timeframe. Once the pieces were in place, TM had to do a stock issue and sell senior notes, which together brought in $3.8 billion, in order to raise the funds for the purchase. I think it’s fairly safe to conclude from all of this that TM didn’t have the money for the transaction until very recently. The AT&T variant does not support this band/frequency. The AT&T HTC One supports Band 17, which is the B and C blocks of the 700mhz spectrum. The T-Mobile’s A block is band 12. It makes total sense. Your phone does not support the frequency and T-Mobile won’t even use the frequency until the end of the year. Relax, by the time LTE is deployed on the new frequency, your phone will be two years old and you’ll be itching to upgrade. If you don’t want to upgrade, that fine also. Your phone will work just as well as the day you bought. When will tmobile introduce new voice/text plans? Unlimited talk & text,…not good enough somehow??? Maybe not everyone wants to pay for unlimited minutes? I’m stuck on a value plan; 500 minutes/unlimited text/truly unlimited data. To switch to the new plans would cost me an extra $10/month. I got to try 20+20 in Dallas over the weekend. I had 4.05 down and 17.36 up. This was north Dallas area. The up speed was awesome but network congestion down was terrible. Normally at home I get over 30 down and around 10 up. What part of North Dallas. I know near the tollway and belt line isn’t very good. If I go to 75 I get LTE easily. If you’re getting 4 Mbps down, it wasn’t 20+20. Not everywhere in Dallas is 20+20, just parts of Frisco and Plano at the moment. Congested on 20+20 looks like 50 Mbps, not 4. That’s true, and why I asked what part of Dallas he is in. I do not understand T-Mobile’s coverage map. In Jackson, MS, the coverage map says that my home address and work address has LTE, but it does not show on my phone or any of my friends’ phones. At work, my phone switches between EDGE and 4G HSPA+ alot. Is this what happens before LTE is launched? On sensorly(DOT)com it shows some trails of 4G LTE so T-Mobile is probably still working on the towers all over Jackson just be patient LTE is coming. How long does work on a tower normally takes?